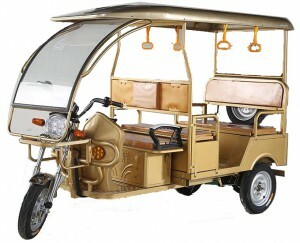 How can I Buy and start e-Rickshaw business? How much earning should i expect per day ? An average of 100kms/8 hrs of charging. You’ll run it for distance of 5 kms(one way). So it will run a total rounds of 20 kms(100/5 i.e. total average divided by one trip). and for each trip you’ll be charging Rs 10/head. Now you made it run for 15 rounds, Now suppose you made it run for 15 rounds you’ll end up having around Rs 600(assuming that each time 4 passengers boarded your e-rickshaw). Now calculate it according to your needs. what all i have to consider while buying the same ? The weight of the body– it is kept light in order to ensure the optimum performance of the battery(the most important component in an e-rickshaw). however, strength of chassis is very much important as well in order to ensure the safety of the passengers. Therefore they are made with Tubular Chasis Body which is made up of F.R.P aluminum and other composite materials. The other most important parts of the e-rickshaws are the throttle, motor, controller and the harness. If there is a mismatch in between any of these important parts then it will cause problems in the long run. It may reduce the performance of the e-rickshaws in the long run. Other electrical components which would ensure the longevity of your vehicle. Summing up, you need “ICAT” approved components in your e-rickshaw and above all you need a trusted brand who could provide you with it. Do have a look at Qiangsheng and their State approved credentials. Moreover, you can also gain additional information by visiting http://www.ermparts.com.